*If you don't like history, you can skip this first part. I rarely get to share another interest of mine in this blog, so I'm using the opportunity to combine the two! I adore art history and am always intrigued by how much we can learn about humanity at one particular time through the art we created. The simplest details of shapes, colors, and lines in any piece of art can help us dictate what a kind of political ideals, religious beliefs, and values a society had. To see history depicted so beautifully and creatively throughout human history is very inspiring and fulfilling to me. I'd say my favorite art definitely comes between the 16th and 19th centuries. That's A LOT of artistic movements to cover in that time span, but from the Renaissance to Impressionism it's so hard to choose a favorite! What falls between that time frame is Rococo. Rococo was an 18th century artistic movement that developed in France. The Rococo movement was like most artistic movements--a reaction to the previous one. The previous Baroque style was rigid and majestic. That pretty much got old, and Rococo artists desired a more a fluid, fanciful, and flamboyant style. This movement brought us what I find to be the most iconic piece of the period, The Swing by Jean-Honoré Fragonard. The use of pastel-colors, curvy lines, and ornate embellishments were major themes in Rococo art. I loved this movement as it was a complete break from tradition, plus it was soft and pretty. Many people of the time disapproved as this art because they felt it was hedonistic and not serious. They were poopy heads. Sorry, I think I forgot this was a nail polish blog for a second! Thank you though for letting me share another one of my passions though. This all brings me to HARE Polish Rococo Grander, which I was instantly attracted to because of how spot-on to the Rococo movement it was. 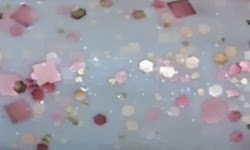 Rococo Grandeur is a soft pale blue jelly with a subtle blue shimmer, pink glitters and gold glitters. Color: Beautiful color polish, and totally true to the theme. I love it for so much for personal reasons, but outside of that it is a great color. I do not own anything like this in my stash either. Formula: This is where this loses brownie points for me. I used 4 coats in the swatch above, the formula is a bit thick, and doesn't even out completely smooth. That being said, it did manage to get it to work for me, but I'd prefer it was better. Price: I got this for $10.00 on the HARE's etsy site. This is currently out of stock though. Check back on HARE's website for stock updates though. Overall: This is a beautiful polish. I love the combination of colors, and clearly I adore the theme. The formula disappoints though. For me, the theme and color > formula. This is certainly not the case for all people or all polish, so you can be the judge on whether you want this. This is gorgeous! I recently got mine in the mail and I can't wait to wear it. I love how soft and feminine it is. This is so pretty on you!! Such a pretty color, what a bummer the formula isn't that great. I think this a really cutesy color. It looks good on you.